There have been so many things I've wanted to blog about during the past month. There are all sorts of details I wanted to share. Between my home computer and the laptop, there are photo files I haven't touched. January went by in a flash. 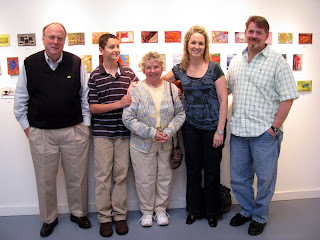 First, there were CYBER FYBER preparations....followed by the reception and Fiber Day...family....manning the show....ATC Day...making videos...then dismantling the exhibition and mailing back the work to the invited artists. There was end-of-grant paperwork to do and prizes to mail to the postcard and ATCs winners. There's also been a pile of framing to do at Mouse House. Also, I'm already at work on next year's CYBER FYBER 2. The result is simply.....I'm not even going to try to catch up! Instead....I'm back to work. Stitching. Making art! 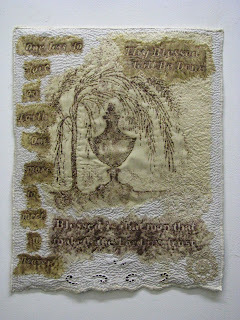 This weekend was the first time in "ages" that I spent quietly in my studio with needle and thread. It felt wonderful, and I finished two pieces. Here they are! Before Christmas I started both Rabbi and Priest. The experience was spiritual....the connection between the two portraits added to the season. Rabbi was done first. It included the words "Waiting for the Messiah". I knew I wanted a Star of David blackwork pattern. Somehow, the need for blackwork continued but the star became the one for Bethlehem, eight points....just like all the stars in early Italian renaissance frescoes set in a sea of ultramarine blue pigment. Hence, the color. As I worked, I realized that both these men are "Waiting for the Messiah"....first or second time....it's not so important. Both these men were also "Called to Serve". In a since, their decisions are very, very similiar. 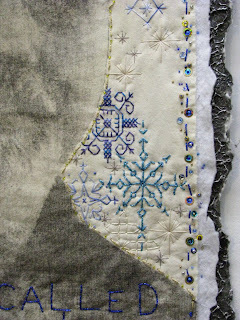 Intuitively, my stitching approach was also similiar. I'm quite pleased with both works. Yes, I know my "priest" wasn't wearing a fatherly collar. I liked it better this way. Each work in this series is meant to be viewed....straight forwardly....with no value judgments....person to person. The decision is the important thing....not the costume! I also finished the piece below. 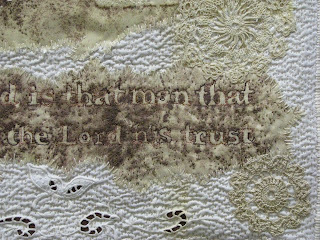 It's part of a new series, grave rubbing quilts. Everyone knows that today is a historic day. There's an inauguration in Washington, DC....lots of buzz on television, the Internet, and in this morning's newspaper. It's a big day here at CYBER FYBER too.....a big day on the heels of a big weekend....at the end of a major fiber exhibition here in Columbia, South Carolina. Yes.....CYBER FYBER ends today at 5 PM. On Sunday I hosted an informal gathering in Caroline's honor. Susan Sorrell, Caroline's long-time on-line fiber instructor, had cancelled but the afternoon was still lots and lots of fun. Yesterday was a busy one in the gallery. 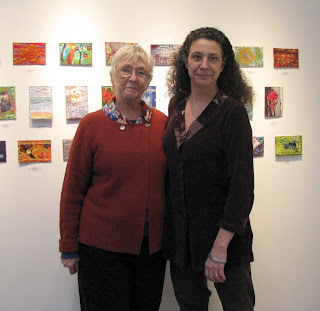 Caroline was able to tour Ellen Kochansky's art residency studio at 701 Columbia Center for the Arts. We went to dinner at Gervais and Vine. Then, I tried to sleep but dreams of all the people, inspiration, and future plans for CYBER FYBER 2 danced in my head. CYBER FYBER has attracted so many people.....those who only go to art venues now see stitches in a new light....many who sew see their creations destined for gallery walls...there were ladies from the Charleston quilt guild, the Fringe Sisters, a group of French quilters whose husbands work for the Savannah River Plant, women from Charlotte, Nellie Durand and her husband from Tennessee with friends, Betyann Shaver's entire family from Aiken, Joni Fedderson and her husband from Sumter, Jill Rumoshosky Werner at the opening reception, Fulvia Boriani Luciano and fiber friends on ATC day, Mimi Renne Sainte-Laudy's family, tatters and knitters and those who crochet, all sorts of people who learned about ATCs and others who didn't think anyone else in the area even knew what an ATC was. Linda Neely, the Interim Dean of Education and Art Professor at Lander University sent three ceramic ATCs for the International Random trade....and I didn't even know she was aware of CYBER FYBER! Sarah Graham, a local librarian who helped with ATC Day was one of the lucky receiptants of these interesting cards. Deirdre Mardon came to Sunday's party and was thrilled with the response. As director of the Conagree Vista Guild/CYBER FYBER's lead sponsor, her impression is quite important. We brain-stormed about the future direction for CYBER FYBER 2. Every day has been an adventure. 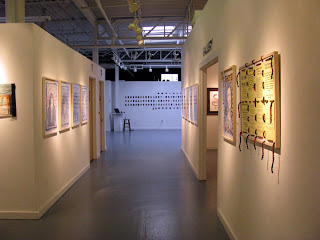 Today is the last one for the show at Gallery 80808/Vista Studios....but the journey is far from over! Steve and I will dismantle the exhibit at 5:00 PM today. We'll be boxing all the artwork in the Main Gallery and sending it back to the artists....except for Veleta Staffney....all three of her pieces are sold! We'll have an opportunity to thank the Vista Guild for their support at tomorrow's monthly meeting....and "warn" them that we'll be needing their help again in 2010! So....today is the last of CYBER FYBER....but it is just the beginning of CYBER FYBER 2, January 7 - 19, 2010. I can honestly say that the coming show will NOT be the same as this exhibition. I have no problem doing lots and lots of work again....but it absolutely CANNOT be the same work! CYBER FYBER must evolve....it must be an exhibition that shows how the threads of communication established this year have stitched us together into something else! I also know that the future show requires input from our supportive, global community of Internet connected fiber artists! So.....let me know your ideas! Post a comment or email me at cyberfyber@prodigy.net or mouse_house@prodigy.net! Lots has been happening here at Gallery 80808/Vista Studios in Columbia, South Carolina where CYBER FYBER is on display. Every day people come to see the show! The publicity has brought all sorts of people who have never been to the gallery, looked as textiles as art, or heard of ATCs and postcards being traded. All sorts of local quilters, embroiderers, and other textile artists have also come.....most of whom I've never met. Thus....all sorts of wonderful new connection are being made and common interests are being shared! It's been exciting! CYBER FYBER gets a review! A review of Cyber Fyber, on view at Gallery 80808/Vista Studios through Jan. 20. Cyber Fyber is not your average gallery exhibition. 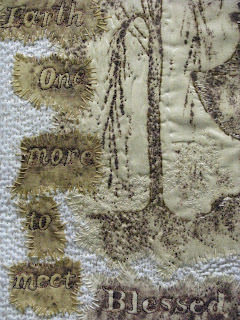 It is the culmination of a monumental, yearlong project developed by Columbia-area fiber artist Susan Lenz. The project was inspired by the sense of community she developed with other fiber artists around the world through her blogging experiences. The Internet is a vast web of resources that is very attractive for visual artists in particular. Most artists use it to market their work through web sites and online galleries. But many others are taking advantage of the social and professional networking opportunities not only to market their work, but also to create ties with other artists throughout the world. Some limit themselves to the main social networks like MySpace and Facebook; others use using free blogging sites to create their own networks. 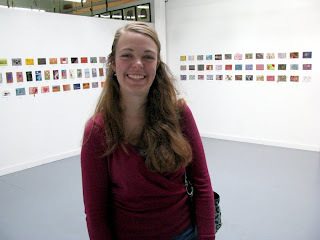 Lenz has done all of the above: She has 12 blogs associated with the Cyber Fyber exhibit alone. The quality of the artwork is high, but the most important thing about the exhibit is the process Lenz used to put it together. It is a manifestation of the paradigm shift in the art world resulting from artists making full use of the Internet to control their own careers. Art entrepreneurs like Lenz are going beyond simply organizing their own local exhibitions to building national and international networks that they can use for both marketing and professional support. Lenz was able to curate a truly international fiber arts exhibition purely from the contacts that she made via her blog, an unthinkable feat 10 years ago. The show includes work by artists from more than 26 countries including Australia, England, Germany and Canada, as well as the United States. Cyber Fyber has two components: 400-plus fiber cards that Lenz traded with other artists, and larger works by 17 artists in an invitational section. Some of the small cards are little gems, but the main impact of this section comes from the sheer visual weight of so many pieces. The grid pattern that was used to hang the pieces makes this section read as one large quilt. The invitational section has some more traditional work, but most of the work could stand on its own in any contemporary art setting. Cyber Fyber is a four-panel book piece by Jacqueline de Jong of the Netherlands. Accordion folds allow the work to stand on its own on the pedestal where the viewer can see both the front and the back of the panels. She uses a range of dark earth tones in her richly textured abstracts. Fulvia Boriani Luciano, from South Carolina, also works with abstract forms and shapes. She creates quilted hanging pieces in various grid formats, exploring subtle color relationships. 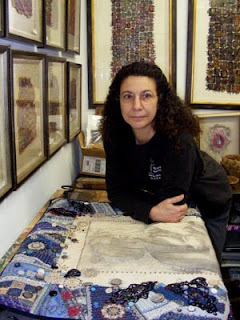 Penny Sisto of Indiana also makes quilted wall pieces, but she uses representational imagery to create narratives that deal very openly with social commentary. Strange Fruit VI is dominated by a large female figure, her mouth open in a scream or cry. To her right, six male figures swing in the branches of a tree. 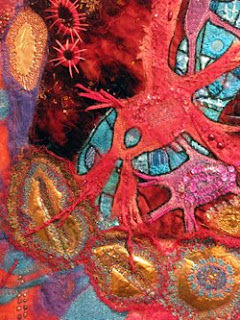 The range of work in both sections gives an overview of the broad range of styles and content being addressed by contemporary fiber artists. The invitational has allowed Lenz to go deep with the work of the 17 selected artists. The exhibit showcases the potential of the Internet to change the reigning dealer/artist art-world paradigm. The role of the middleman, i.e. the dealer, hasn’t been eliminated — yet — but that role is definitely shifting. Above is a link to the University of South Carolina's Daily Gamecock newspaper where the talented Ellen Meder, Assistant Mix Editor, wrote an article on CYBER FYBER complete with an on-line slide presentation. In order to preserve this information and the images, I've posted it on the CYBER FYBER journal here. I cannot possible begin a post that would capture all the emotions, events, and important nuances of the past several days. I will not even try. There are no words that dig deeply enough or soar to the heights I've experienced. Suffice it to say that CYBER FYBER opened, compliments and champagne flowed, FIBER DAY exposed many to the wonders of needle and thread....there were family reunions, precious pictures, new friends, kindred spirits, and all the interconnectiveness that CYBER FYBER promised....plus so very, very much more. I blogged about some of it. The announcements of BEST OF SHOW Postcard and ATC is here! The reception video is here! 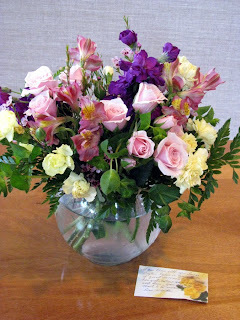 My stream of consciousness (otherwise known as grateful rambling!) from Sunday, January 11...is here! Otherwise, I'm now manning the exhibition every day.....Sunday through Saturday....from 11 - 5. People come and go! All are amazed with the talent, the diversity in techniques, the number of countries and artists involved, the quality, color, texture, and joyous textiles on display. It is my honor to accept all the compliments on behalf of everyone who traded, sent work, left messages, and supported this effort. This image appeared on the front page of the Life and Style section of The State newspaper today. After I read it, I went to the gallery and opened CYBER FYBER. Interesting people trickled in and out all day....not bad considering the opening reception isn't until tomorrow night! The entire article appears here on the CYBER FYBER journal...with all three images. It mentions tatting....but I've never tatted. When I read this, I smiled....figuring that this was just an embellishment. As an embroiderer, I don't mind embellishments, of course. 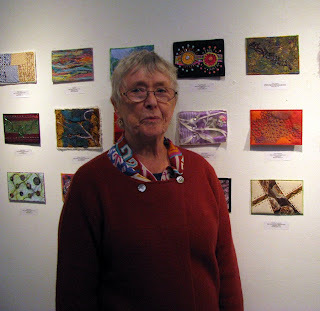 Naturally, one of the first people to visit the exhibition was Pam Freck....from the Palmetto Tatters Guild! It was quite hilarious....but a fabulous new fiber connection for CYBER FYBER. 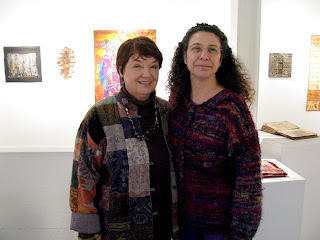 I blogged about our meeting and also about Wilma Black who visited from the South Carolina Quilters and shared the Artfull Bra Project with us. I wrote this blog post on the CYBER FYBER journal, here. It's late at night! I hope I sleep! I'm so excited that I might not sleep a wink! Tomorrow is less than a few hours away. I've been dreaming, waiting, working, fretting, and worrying about tomorrow for an entire year! Tomorrow is the OPENING OF CYBER FYBER! To celebrate, I've just completed the exhibition video. Click here to access! Enjoy! There are more videos, award announcements, blog posts, and fun to come! It's late! I've been working all day at Gallery 80808/Vista Studios where CYBER FYBER, the REAL....ACTUAL...PHYSICAL exhibition is currently hanging! There are "pre-lighting" photos on the "journal". After some problems with the Internet connection and about an hour or two on the telephone with a nice lady at Verizon, the laptop is now working perfectly. The show is "connected". My artistic mentor Stephen Chesley helped to set the lights. All the invitational artwork is properly in place. Tomorrow I start work on the signage. At least the labels for all the postcards and ATCs are ready to stick into place! The CYBER FYBER main page has been updated....especially the post about FIBER DAY. This includes lots of interior shots of this amazing store as well as images of House of Fabrics, a fantastic place that has donated a "stash" for the prizes. By the way....in addition to PEOPLE'S CHOICE for "favorite" postcard and "favorite" ATC, there are now two more prizes. 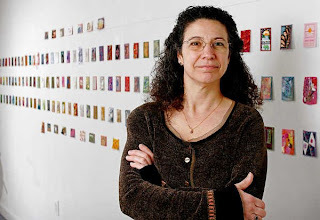 I've enlisted Ellen Kochansky, an extremely talented fiber artist from Pickens, South Carolina who is in the midst of a textile installation residency at 701 Columbia Center for the Arts, to jury the awards for "BEST OF SHOW" postcard and "BEST OF SHOW" ATC! She has absolutely no idea just how many outstanding works with which she'll be faced....and have to chose just one! Poor Ellen! 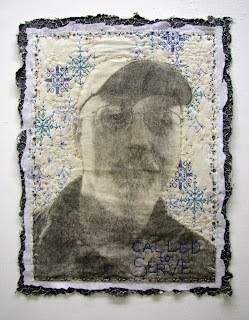 I even stitched a little on my newest piece for the Decision Portraits Series. The work is also included in CYBER FYBER. The last thing I did today was to upload images onto MY FAMILY BLOG that were Mathias' trip to Japan....almost a year ago. I think he finally had to "do something" with the pictures in order to clear the camera's chip. Right now....even as I'm typing....Mathias and Birmingham Royal Ballet are in flight to a three week tour of China. I hope I don't have to wait a year for those pictures.